Stevens previously served on the faculty at Rutgers and Yale Universities and is a faculty research associate with the National Bureau of Economic Research. At UC Davis, Stevens has served as Chair of the Department of Economics and Interim Dean of the Graduate School of Management. She received her Ph.D. from the University of Michigan and has served as a principal investigator on grants from the U.S. Department of Health and Human Services, the National Science Foundation and other agencies. For the past two decades, U.S. anti-poverty policy has coalesced around the idea that work should be at the center of anti-poverty programs. Bi-partisan welfare reform in the 1990s focused on work requirements and time limits. The growth of the Earned Income Tax Credit (EITC), which increases after-tax income for those working at the bottom of the wage distribution, has also emphasized the importance of work. On September 12, 2017 the Census Bureau released the official poverty rate for 2016 (12.7%), showing that 40.6 million Americans live below the federal poverty line (FPL), currently set at $24,563 for a family of four. This poverty measure is an estimate of the annual income required to meet basic needs. These lectures are part of a UC Davis hybrid course on poverty and public policy taking place in 2016. The course is led by Ann Huff Stevens, a Professor of Economics and Director of the Center for Poverty Research. The Census Bureau’s latest poverty statistics show that last year 13.5 percent of Americans still lived below the federal poverty line. The official poverty rate is a valuable measure of how well we as a nation ensure opportunity for those who earn the least. However, just as important is understanding why the poverty rate has not changed, how it affects those who are poor and what policies can make a difference. Where in California has the gap between rich and poor grown most since the recession? The Bay Area, home of some of the most expensive ZIP codes in the country, seems like a logical answer. Transiciones hacia y fuera de la pobreza frecuentemente ocurren después de acontecimientos importantes como casamientos, divorcios o cambios en ingresos. También las transiciones son asociadas con factores económicos, como tasas de desempleo y salarios. Entendiendo los impactos de cada uno puede mostrar las diferencias entre la pobreza de corto plazo o circunstancial y la pobreza a largo plazo asociada con limitaciones permanentes en ingresos, empleo y estructura familiar. En un estudio reciente, yo encontré que en los Estados Unidos, semanas individuales trabajadas y niveles agregados de salarios son los más importantes predictores de cómo uno puede escapar o evitar la pobreza desde un año a otro. 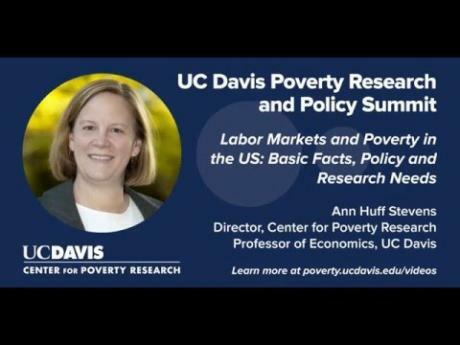 In this presentation, economist and Center for Poverty Research director Ann Huff Stevens discusses how stagnation of wages at the bottom of the US wage distribution over the past several decades and continuing low rates of full-time work, especially in single-parent households, often leave families below the official poverty threshold. California’s wealthiest taxpayers are the state’s only group experiencing rising incomes, a reflection of a broader national problem of growing wage inequality. In this video, economist Ann Huff Stevens discusses income inequality and the lasting effects of poverty during childhood. These lectures are part of a UC Davis hybrid course on poverty and public policy offered in fall 2017. The course is led by Ann Huff Stevens, a Professor of Economics. This special podcast report describes a new study by center director Ann Stevens and graduate student affiliate Chloe East that examines how many workers at or near the minimum wage still rely on safety net programs to help their families get by. Listen now. DAVIS, Calif. — UC Davis graduate students affiliated with the Center for Poverty Research have recently won a number of prestigious fellowships for their research. This year, fellowships graduate student affiliates have won include the UC Davis Provost’s Fellowship in the Arts, Humanities, and Social Sciences; National Academy of Education/Spencer Foundation dissertation fellowships and the American Sociological Association Minority Fellowship. In recent years, UC Davis, with the support of the U.S. Department of Health and Human Services, has taken on a crucial role in the fight against domestic poverty. Sacramento workers want to raise the minimum wage, but will it hurt small businesses? Ann Stevens is quoted in an article about raising the minimum wage. Imagine you’re a 37-year-old woman, three months pregnant, living in the Arden-Arcade area, taking the bus to your job at Burger King, where every week you work 40 hours but only earn $9.25 for each. In his State of the City speech Thursday night, Sacramento Mayor Kevin Johnson said he wanted to put together a task force to look at raising the minimum wage in the capital city. Currently, the city’s minimum wage is the same as California’s state minimum wage — $9 per hour. In 2016, it will increase to $10 per hour. But some cities across the nation, such as San Francisco and Seattle, have sought higher minimum wages for their workers. DAVIS, Calif. — Center director Ann Huff Stevens has been appointed interim dean of the Graduate School of Management. Stevens will continue to direct the center but will give up her position as chair of the Department of Economics. She will serve as dean until the position is filled permanently, but will not be a candidate for the job. Stevens’ appointment is effective October 1. “When you’re working erratic hours and not getting paid sick time, that level of stress is huge,” said Ann Huff Stevens. STANFORD, Calif. — The Stanford Center on Poverty and Inequality featured work by Center for Poverty Research directors and affiliates in their summer 2014 issue of Pathways magazine. The articles by Ann Stevens, Marianne Page, Giovanni Peri and Hilary Hoynes, focused on aspects of labor markets ranging from immigrants to job loss to safety net programs. DAVIS, Calif. — The UC Davis Center for Poverty Research has launched a program to host undergraduates from Historically Black Colleges and Universities (HBCUs) for summer experiences with poverty research and mentorship toward academic careers. For the long-term unemployed, finding a job is hard — but keeping one may be even harder. …Negron’s experience echoed prescient research conducted nearly two decades ago by economist Ann Stevens, now at the University of California at Davis. She looked at data tracking workers from 1968 to 1988 and found that 41 percent who lost their job once were unemployed at least once more during that period. Almost all of the subsequent job losses occurred within five years of the first one. Stevens’s study did not explore the fate of the long-term unemployed. Still, she found that multiple spells of unemployment depressed workers’ wages by 9 percent even after several years. DAVIS, Calif. — More than 60 women leaders from the Sacramento region convened at UC Davis in March to discuss the complex challenges women face in the workplace with an eye toward policy that could affect the nation. Over the past 45 years, the United States has experienced a rising standard of living, with real GDP per capita more than doubling between 1959 and 2004. In contrast, living standards among some groups seem to have stagnated. Although a number of studies have documented a correlation between macroeconomic conditions and poverty, the relationship is not as simple, or as strong, as one might think. What additional factors can explain the starkly different trends in economic well-being that are measured by overall GDP growth and the poverty rate? SACRAMENTO, Calif. — Center for Poverty Research Director Ann Huff Stevens presented on poverty in California at the first meeting of the new legislative caucus on ending poverty in the state. In America’s new normal, plenty of Americans will tumble into poverty at some point – but few will be stuck there forever. Nearly one in three Americans experienced a stint of poverty between 2009 and 2011, a new Census Bureau report finds, but only a fraction of those people were stuck below the poverty line for the entire three-year period. “There’s a lot of movement in and out of poverty,” said Ann Stevens, director of the Center for Poverty Research at UC Davis. California, the state renowned for Beverly Hills mansions, glittery Hollywood stars, Malibu beaches, palm trees, and the stunning Golden Gate Bridge, hides a deep, dark secret – it has the nation’s highest poverty rate. DAVIS, Calif. — Amid the 500-plus pages of the newly released Shriver Report on poverty among women, you will find the Thrive Index, the work of UC Davis economics professor Ann Huff Stevens with research assistance from MBA students in the Graduate School of Management. 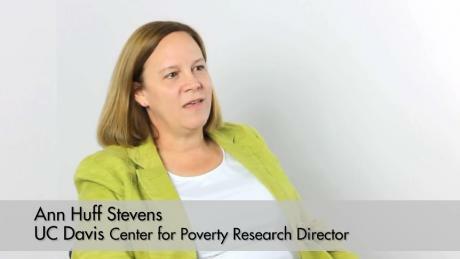 Stevens is chair of the Department of Economics and director of the Center for Poverty Research. Read about the center’s recent two-day conference marking the 50th anniversary of LBJ’s War on Poverty. When President Lyndon Johnson declared an “unconditional war on poverty” in his State of the Union address, 50 years ago this week, the official poverty rate was 19 percent. Last year, it stood at 15 percent. And so the war goes on. What that official measure of poverty fails to capture are other, harder-to-quantify successes, according to Ann Huff Stevens, economics professor and director of the UC Davis Center for Poverty Research. “Because we now provide a substantial number of low-income families with Medicaid, with health insurance for their children, with food stamp nutrition support, with school lunch, we see improvement in the health of the poor people,” Stevens said. During the tail end of the recession and its aftermath, nearly a third of Americans suffered bouts of poverty lasting two months or more, the U.S. Census Bureau found in a newly released report. “The fact that someone comes out of poverty for a few months should not lead us to conclude that poverty is not chronic,” said Ann Stevens, director of the UC Davis Center for Poverty Research. Though only 3.5% of Americans were poor throughout the entire period from 2009 to 2011, Stevens said, other research suggests many more bobbed in and out of poverty. Jan. 8 marks the 50th anniversary of legislation launching America’s War on Poverty. The story of that war is often told with a sort of reverse Hollywood ending: oversimplified and wrapped up neatly as a failure. No one can claim that the war on poverty has been won, but the failure narrative is just as wrong. The real story with some fundamental facts highlighted is more complex than simple wins and losses, and long overdue. A new way of measuring poverty reveals California has by far the biggest share of people in economic despair, eclipsing states such as Mississippi and Louisiana, when housing and other costs are factored. The alternative yardstick, known as the supplemental poverty measure, found nearly 2.8 million more people are struggling across the country than the traditional benchmark shows. An alternative method of measuring poverty revealed that California is the most impoverished state in the country, with nearly a quarter of its residents living below the poverty line due mostly to housing costs. Under the study, a household of two adults and two children earning less than about $35,000 would be considered below the poverty line, said Ann Stevens, director for the Center for Poverty Research at UC Davis. That number was increased from just over $23,000 used in the official poverty measure in 2012. Listen to a conversation about the new methodology of measuring poverty released by the US Census Bureau on KQED’s “Forum” program. Ann Huff Stevens, Director of the Center for Poverty Research and Sarah Bohn, Policy Fellow at the Public Policy Institute of California, discuss what the new measurement means for families and policy makers in California. Listen to a conversation about the intergenerational effects of the Great Recession on Minnesota Public Radio’s “The Daily Circuit” program. Ann Huff Stevens, Director of the Center for Poverty Research and Ariel Kalil, Director of the Center for Human Potential and Public Policy and Professor of Public Policy at the University of Chicago, discuss research on the effects of parents’ unemployment on children, including effects on earnings, education, and health that suggest a long-lasting impact of the Great Recession across generations. “Even if the economy was rebounding, I don’t think the official poverty statistics show it that much,” said Ann Stevens, an economics professor who directs the UC Davis Center for Poverty Research. Unemployment insurance gives many down-on-their-luck Americans enough income to stay above the poverty line, but Stevens said the official poverty measurements don’t count food stamps, housing assistance and other programs that help people survive but don’t give them cash income.